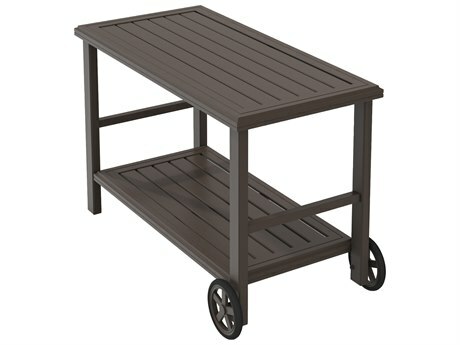 Patio serving carts appear striking and complementary when styled with any outdoor patio furniture arrangement. 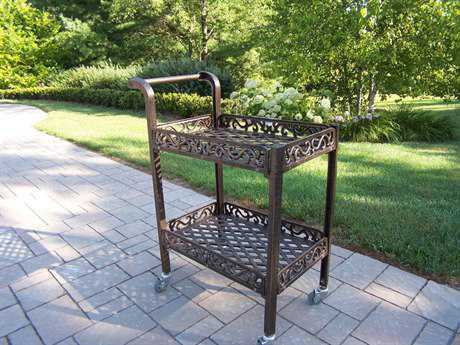 Unique and multi-faceted, an outdoor serving cart brings distinct value and visual appeal to any outdoor space, including both private residential and commercial settings. 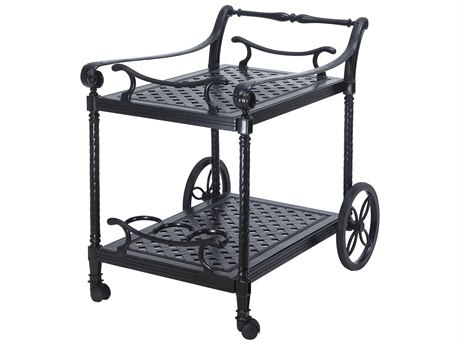 Available styles range from ornate traditional to stunning contemporary, with carts to appeal to varying personal aesthetic tastes and styles of use. 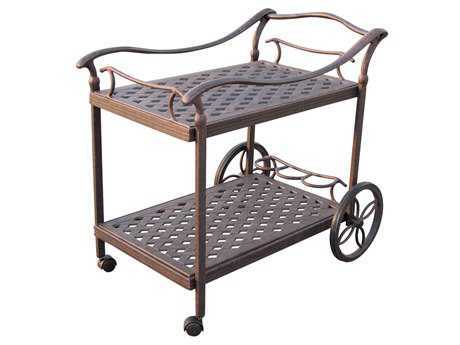 PatioLiving carries a diverse mix of outdoor serving carts, in numerous colors, finishes, styles, and shapes, crafted from fine materials by premium brands such as Woodard, Darlee Outdoor Living, and others. 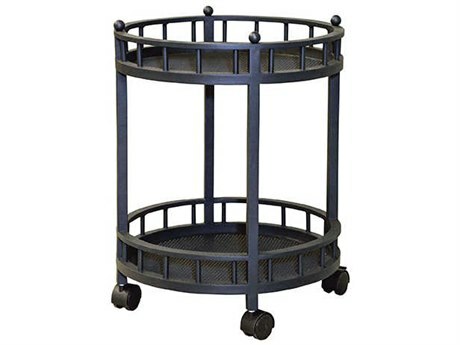 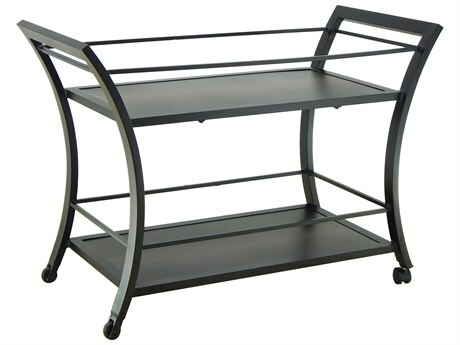 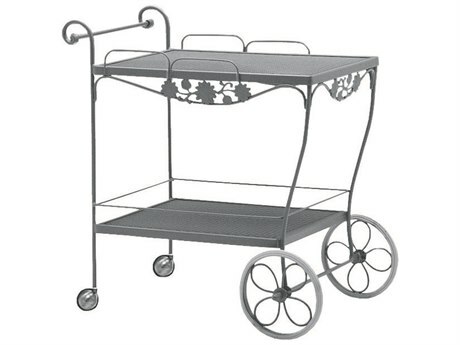 Patio serving carts generally include specific structural components, such as handles, shelves, and wheels. 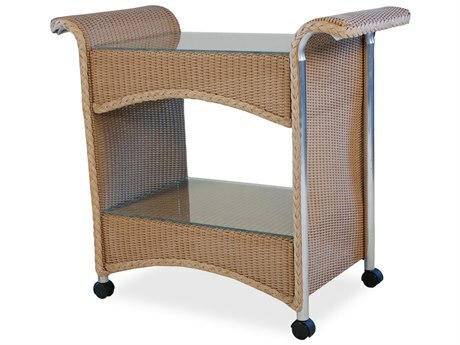 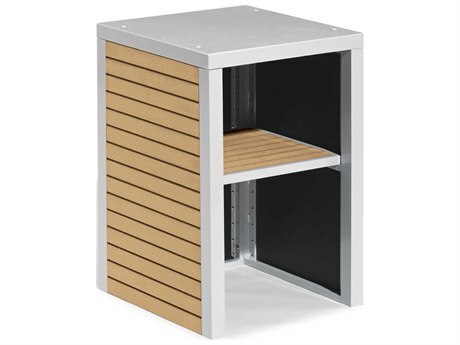 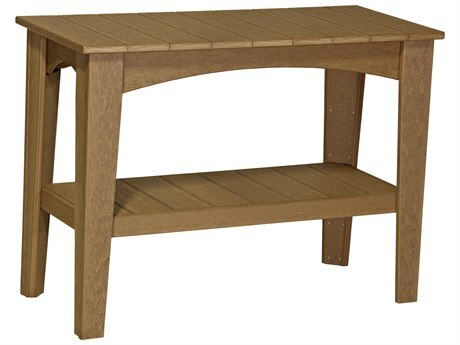 They can serve a multitude of purposes, making them a valuable staple furnishing in any outdoor patio space. 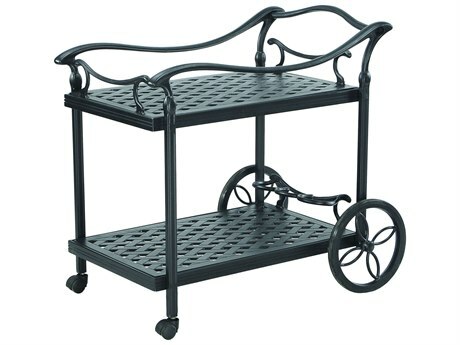 Crafted from popular materials, including aluminum and cast aluminum, wrought iron, steel, and wood, outdoor bar carts exhibit a range of styles to complement any taste. 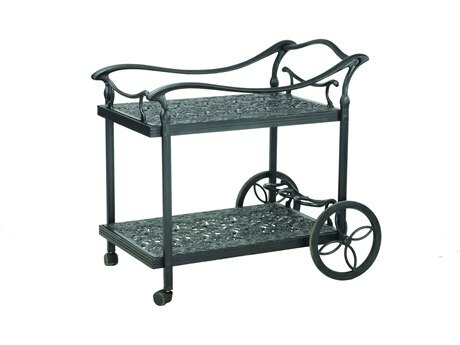 Cast aluminum serving carts connote a traditional, elegant look, with delicate curves, intricate designs, and stunning finishes. 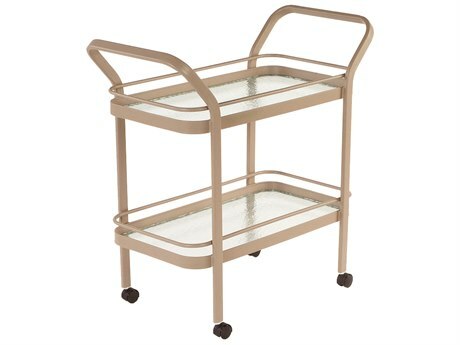 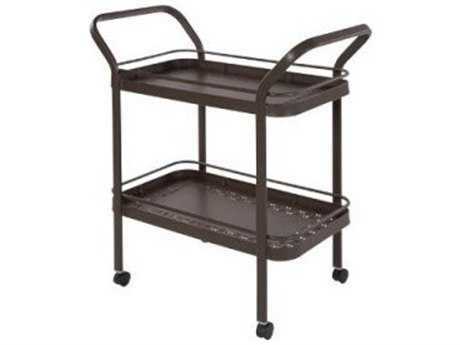 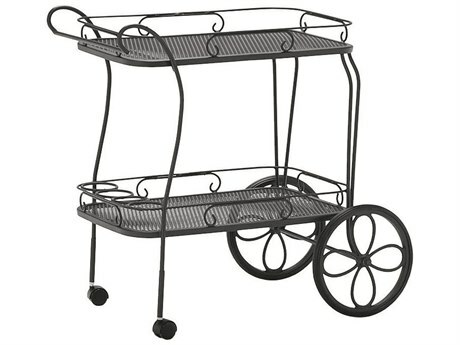 These types of carts pair well with cast aluminum dining sets and other cast aluminum furnishings for a unified arrangement. 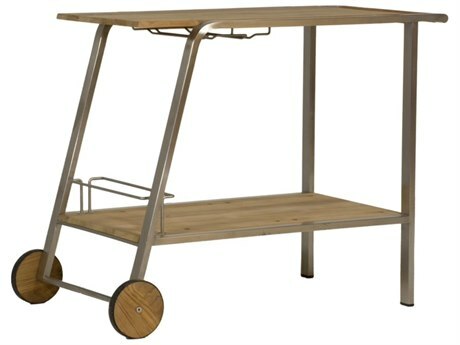 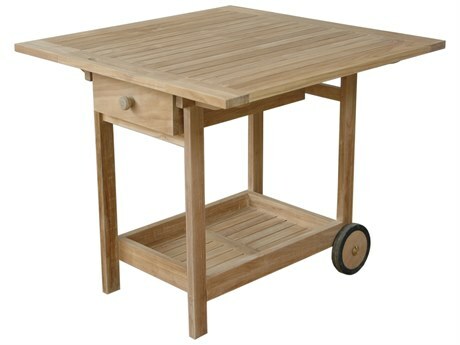 Teak and wood serving carts blend harmoniously with natural outdoor settings, making for a casual and organic aesthetic. 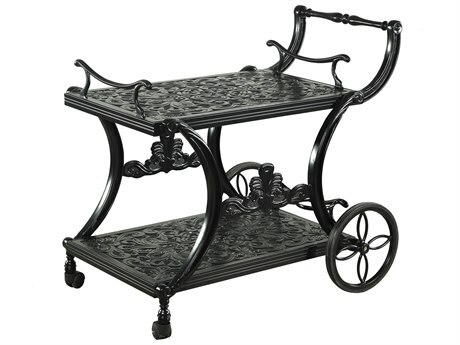 These types of carts can feature popular slated styling or carved designs. 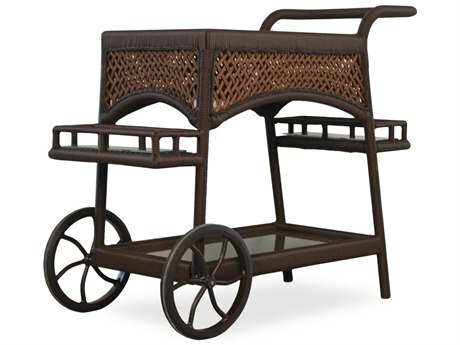 Wicker carts are refined yet casual, with sturdy frames and multiple finish options typically available. 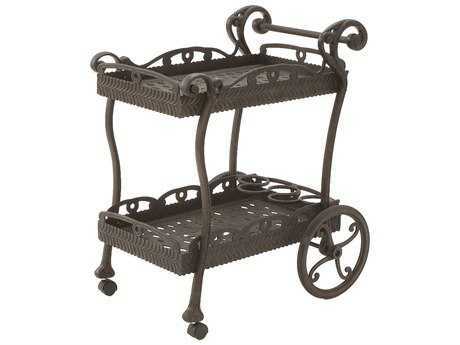 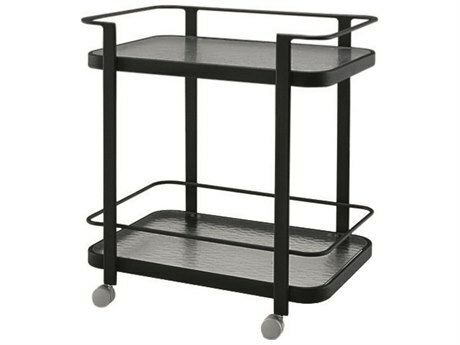 These carts pair perfectly with any wicker dining set or wicker lounge set. 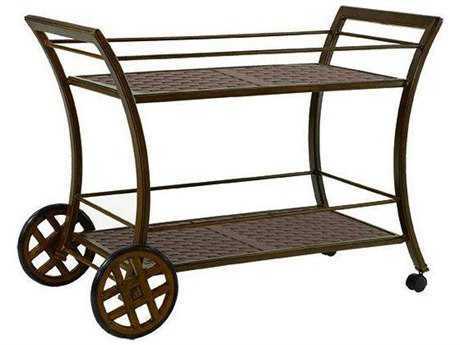 Many carts feature two or more materials in their design, maximizing the functional benefits of various materials for optimum appearance and usefulness. 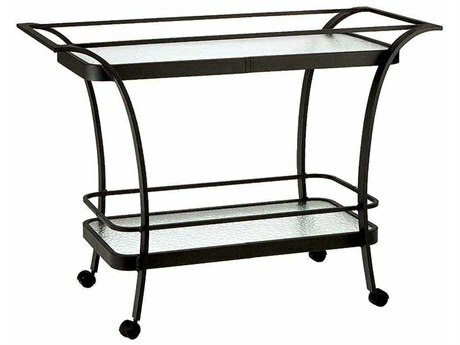 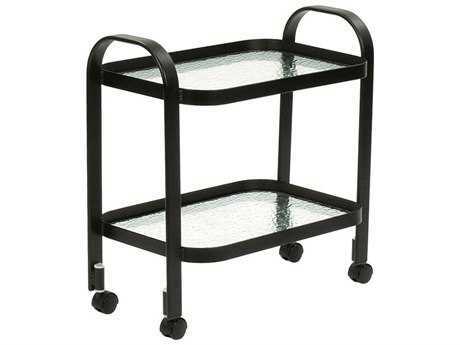 A number of the patio serving carts offered by PatioLiving feature glass shelves, ideal for holding drinks and plates, while others incorporate mosaic stone tops, for striking decorative impact. 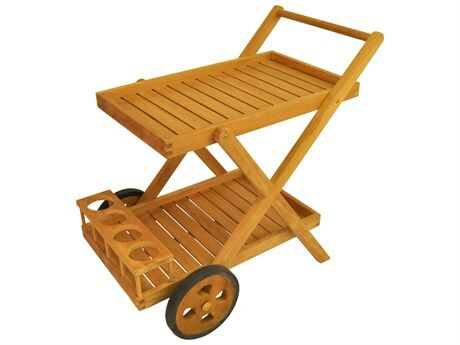 Outdoor cart shapes include circular, square, and rectangular, with sizes to meet various spatial requirements. 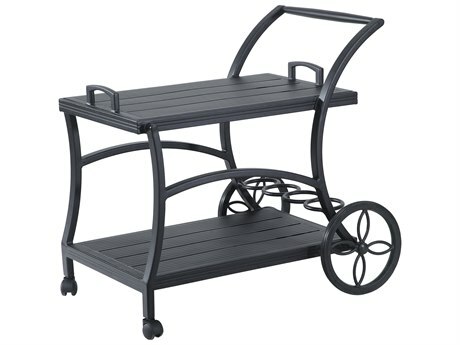 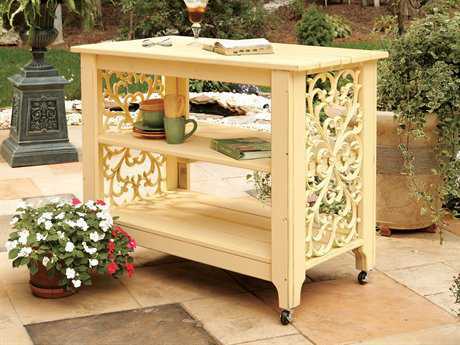 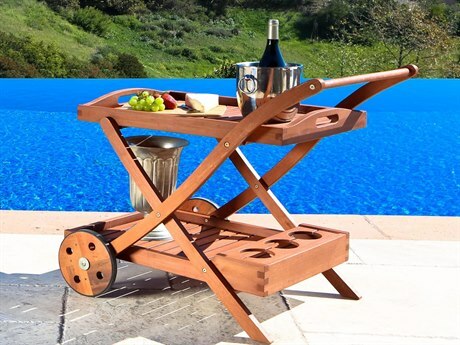 No matter your lifestyle or preferred style of entertainment, an outdoor serving cart is sure to bring both distinct aesthetic value and considerable usefulness to your patio, backyard, or commercial space. 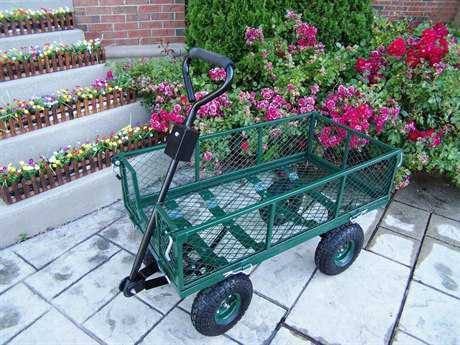 Wheeled carts can easily be moved around on any patio or deck, to safely and easily transport drinks, snacks, or tableware from bar to lounge set, grill to table, or even indoor kitchen to guests gathered outside. 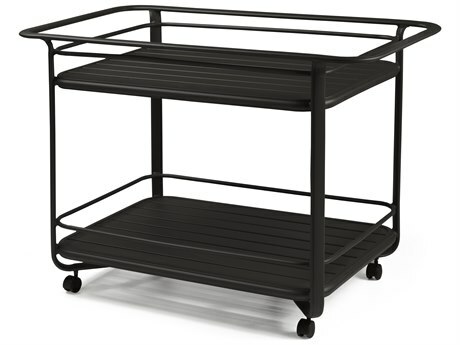 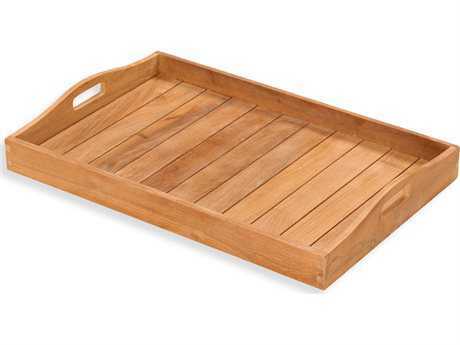 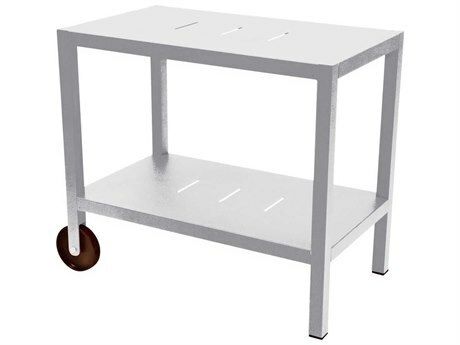 Models without wheels are ideal for use on uneven or slanted surfaces, providing a stable furnishing suited to hold drinks, snacks, and utensils. 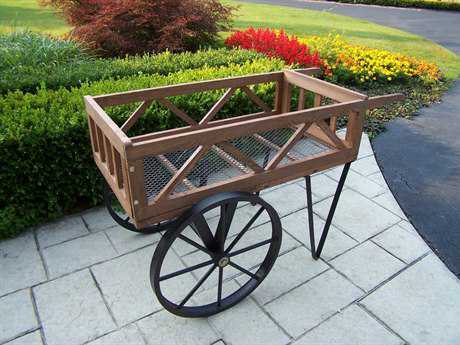 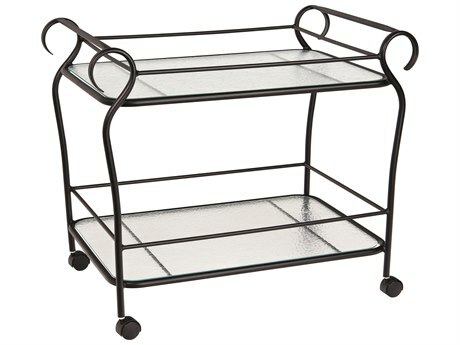 Gardening carts feature sizable handles and tall, basket-style frames, for holding shovels, tools, plants, or soil bags. 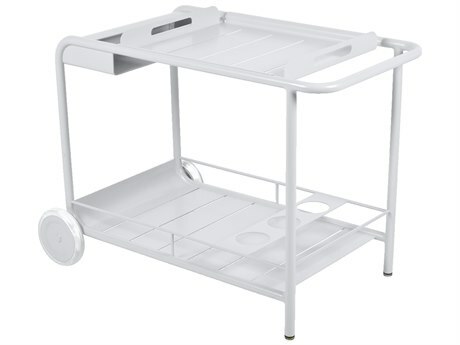 Select outdoor serving carts feature elements such as folding tops or elevated side rails, contributing additional functionality and convenience. 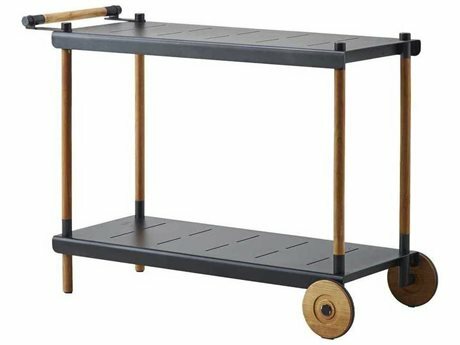 Most patio serving carts are weatherized for use in inclement climates, with wood carts engineered for resistance to rust and precipitation and powder coated aluminum models. 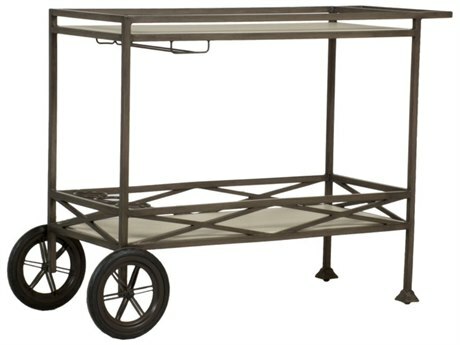 Extended warranties are offered standard with most carts in our shop, ensuring you will be able to enjoy the convenience and style of your patio serving cart for many years to come.